The motto for the 5th annual TGD was "bigger, badder, bedder" because we moved to a hotel venue for the first time (beds!). In retrospect, "bigger, badder, wedder" might have been more appropriate. I know that was low hanging fruit, but *shrug* what else is a person to say about the 1000-year flood splashing your board gaming event? Well, maybe just one thing more: we got all the library games back from Opryland the very next day and they were all 100% high and dry. Even though we had to load them up out of a literally pitch black closet under the light of our cell phones, it was nothing short of a TGD miracle to hook up with our event coordinator in the chaos that was the Opryland lobby (one of the few non-flooded areas) on Monday and to be allowed access to restricted areas of the hotel. It was quite a sight to behold . . . like looking at the Titanic on its way down. Everything smelled musty, and we were able to peer down a stairwell to the level below that was under about 8 feet of water (most of the steps buried) where large round tables like those we had gamed on 24 hours previously were floating. But I'm getting a little ahead of things. TGD 5 was held at the Opryland Hotel and Resort, the largest non-casino hotel in the world. 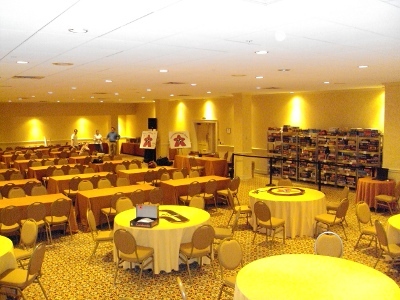 The lovely hotel ballroom venue (pictured here during the calm before the storm, on multiple levels) was certainly appreciated by many of the survey respondents. I hope to see TGD stay in hotels into the indefinite future. Having the ability to keep it open as long into the night as gamers are able to remain conscious is a huge plus. The TGD event docket was broader in scope than in the past, and that seemed well received also. To wit . . . 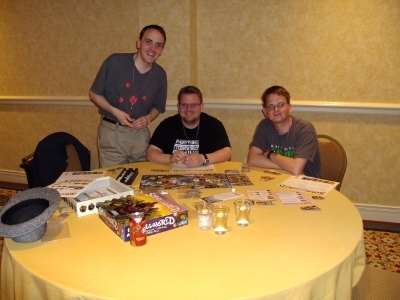 The TGD TGD (Tour of Gaming Destinations) enabled players, old and new alike to join their tour guides on themed gaming adventures. It was a good way for new players to try games, a convenient method for veterans to avoid the "what do we play now" metagame, and an easy way for people who did not arrive with their own gaming group to find open games and meet other gamers. The Crokinole tournaments were a hit and are sure to be back. The themed TGD board was a favorite. Crokinole is a social, friendly, easy game to play that also rewards skill and dexterity as the tournament rounds progress. Traditional TGD event favorites "Take it Easy" and "Wits and Wagers" were well attended considering the attrition that the inclement weather caused (many Fri/Say attendees wisely did not return on Sun). The flea market and math trade were good ways for gamers to make adjustments in their collections while sticking to a tight game budget. Friday's sprinkles turned into Saturday's downpour, which led to Sunday's giant flood. As mentioned, attendance on Sunday was down, for good cause. Sunday saw the lights go out, with gaming by emergency light, by cell phone, and by PK-swag-whistle light. Reports Sunday of the National Guard being called out and locking down the city with martial law were only slightly exaggerated. While there was none of the latter, the former was confirmed. When I made my escape from Opryland Sunday afternoon out of the only route still open, I drove past a convoy of hummers. Many gamers made their way out of the Opryland as weather permitted, but unfortunately, quite a few were stranded and eventually evacuated to higher ground once it was clear the levees were not going to hold back the Cumberland. Several gamers ended up spending a difficult night in a high school gym floor. Many lost automobiles, and had basements flooded as well. But considering the amount of damage and loss of property and life that the flood caused throughout middle Tennessee, the TGD crowd seemed to fair well, overall. I hope everyone from TGD 2010 returns for 2011, where President Rick Keuler has promised 100% fewer natural disasters.